Only 35 units in this condo complex. Judy has decorated lovely for anyone's taste. Stack Washer/Dryer Within the Unit. This is a beautiful beachfront condominium complex. 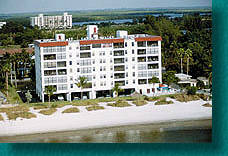 It is located on the south end of Fort Myers Beach on Estero Boulevard, across from the Bay Beach Public Golf Course. There are 35 units in the complex. The building is six stories high with each unit having a designated parking space on the ground level. There is also security access to the building. 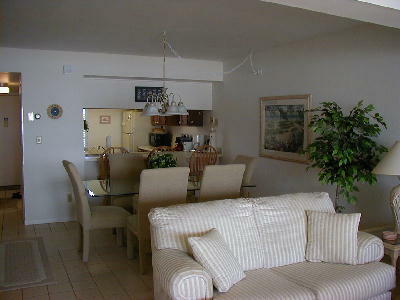 The large screened lanai directly overlooks the beautiful Gulf of Mexico and the complexs lovely private beach. All these features make the condominium very peaceful and quiet, if relaxing is what you have in mind. The unit has two bedrooms and two baths. The master bedroom has a Queen size bed and mounted TV. There is also a tub/shower in the private master bath. You also have private access to the balcony. Two windows in the Master bedroom give you another wonderful view of the ocean. 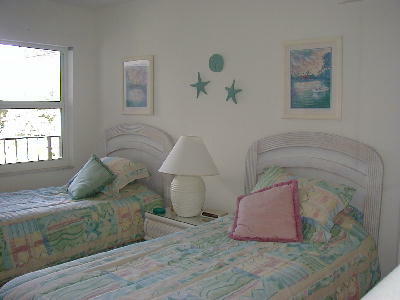 The guestroom has two twin beds and the guest bath has a large shower. There is also a stack washer/dryer within the unit. The condo comes completely furnished with all the comforts of home. There are linens, cooking utensils, 25 color television with cable, stereo, and VCR (feel free to bring along your favorite compact discs and/or movies). 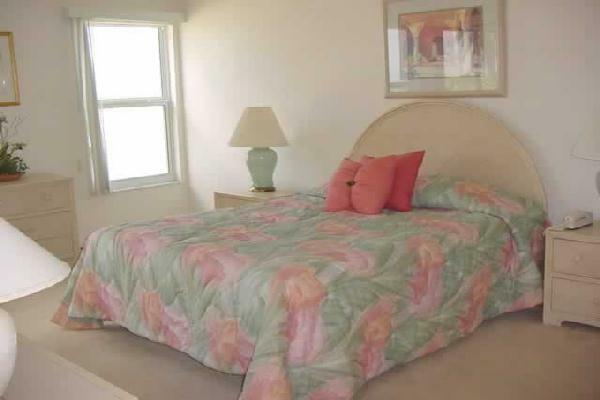 This Condo has a swimming pool and sauna as well as a private sandy beach of Ft. Myers. There is also a covered area on the beach with a picnic table and grill for all to enjoy. Santini Square Shopping Center is located within walking distance just a couple blocks north. Within the shopping center there is a hardware, drug store, clothing, restaurants, deli, pizza, ice cream shop, gift and small furniture stores, etc. for your convenience. A marina is also located next to the shopping center. A public golf course is just across the street from the complex. A large Publix Grocery Store is located just over a mile north of the condominium on the right. Approximately ten miles south is Bonita Beach Shopping Center, which has a large Publix grocery, K- Mart and several other stores. Approximately five miles north is Ft. Myers Beach Town Square with restaurants, shopping, the boardwalk, entertainment, and outside cafés. Very touristy and where the major hotels are located. Approximately ten miles north is a Ft. Myers Shopping Center with a large Winn-Dixie and Albertsons groceries, drug store, etc. In between Town Square and this shopping center are an assortment of restaurants, small shops, Putt Putt Golf, etc. Judy's Condo is a non-smoking unit and no pets are allowed. All these things contribute toward it being very clean and comfortable and cozy. YOUR HOME AWAY FROM HOME. I wanted to write you and tell you that our stay in Ft. Myers Beach was awesome. Judy's Condo was perfect for us. It was tastefully decorated and made us free right at home. The view was great and the sunsets were spectacular!! The pool was the best thing on those hot August days. I can't say enough about Judy's Condo. It was located away from the tourists spots and has a quiet private beach. The lanai was perfect for morning breakfasts or just enjoying the night looking out over the Gulf. 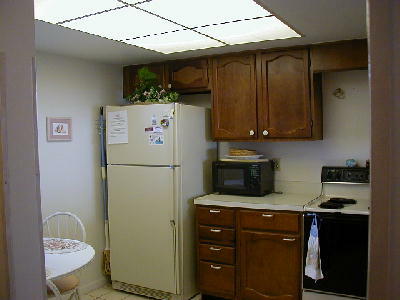 There were shops within walking distance and having the kitchen made it nice to have a few meals in the unit. We will be sure to work with you and Judy again the next time we get the chance to go down there. 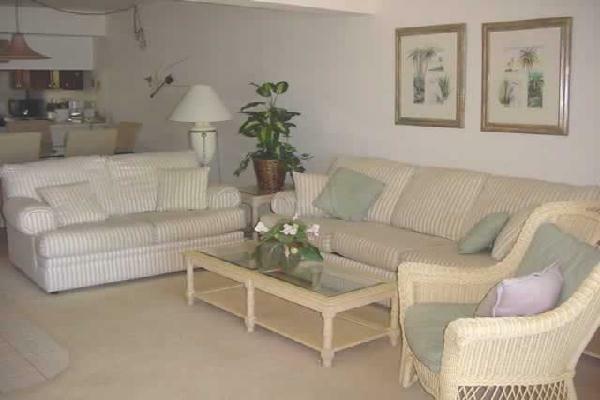 For anyone looking to unwind and enjoy a very clean condo with a great view, Judy's Condo is the place for you.